Actually, illegality is a lot more complicated than that. Laws are made and enforced by humans, in historical contexts, and for reasons. They change over time, and they are often created and modified to serve the interests of some groups--generally the powerful and privileged--over others. Most of the citizens who brag that their ancestors came here “the right way” are making assumptions based on ignorance. They assume that their ancestors “went through the process” and obtained visas, as people are required to do today. In fact, most of them came before any legal process existed--before the concept of “illegality” existed. Illegality as we know it today came into existence after 1965. In the decades before 1965, the media rarely depicted immigration in negative terms. Nor did the public or Congress consider it a problem in need of legislation. By the 1970s, though, the demonization of immigrants--in particular, Mexican and other Latino immigrants--and the issue of “illegal immigration” were turning into hot-button issues. Some analysts argued that globalization was making the world “flat,” and that with the spread of connection, technology, and communication, old inequalities would melt away. Others believed that new inequalities were becoming entrenched--that a “global apartheid” being imposed, separating the Global North from the Global South, the rich from the poor, the winners in the new global economy from the losers. I’ll go more into depth about these changes and show how they contributed to a need for illegality to sustain the new world order. The second set of changes is ideological and cultural. Like the big economic shifts, ideological and cultural changes are a process; they can’t necessarily be pinpointed to a particular date or year. I use 1965 as a convenience, because that’s when some major changes were enacted in US immigration law that contributed to creating illegality. But those changes responded to, and contributed to, the more long-term economic and ideological shifts that were occurring. In the cultural realm, overt racism was going out of fashion. Civil rights movements at home and anti-colonial movements abroad undercut the legitimacy of racial exclusion and discrimination. While apartheid continued in South Africa through the 1980s, even that lost its international legitimacy. In the United States, the Jim Crow regime was dismantled and new laws and programs were aimed at creating racial equality, at least on paper. By the new century, people were beginning to talk about the United States as a “postracial” society. At the same time, though, new laws hardened immigration regimes and discrimination against immigrants in the United States and elsewhere. Before deeply delving into the dizzying and sometimes irrational nature of immigration law, it’s helpful to consider what’s actually happening on the ground. I had the opportunity to see firsthand the human tragedy that’s resulted from the new immigration regime in March 2010, when I participated in a weeklong humanitarian delegation with the organization No More Deaths, one of several that take direct action on the US-Mexico border. Volunteers from these organizations attempt to provide humanitarian aid to migrants by leaving water at stations along migrant trails and offering basic first-aid at camps in the desert, among other things. My group, though, was taking testimonies on the Mexican side of the border from migrants who had been caught and deported. During that week, I met several hundred deportees. They were arrested for a crime no US citizen can commit: entering the United States without official permission. Only people who are not US citizens need official permission to enter US territory. First, the drivers unload their belongings from underneath the bus--a few backpacks, but mostly clear plastic Homeland Security bags supplied by the Border Patrol. After about half an hour, the migrants descend from the bus in small groups. Under armed guard, the lucky ones retrieve their packages and shuffle back across the border to be processed by Mexican authorities. Many have lost everything on their trek through the desert, when they were attacked by robbers, became separated from their group, got lost, or fled from the Border Patrol. Processing takes about fifteen minutes. The migrants receive a slip of paper attesting to the fact that they are deportees. The paper confirms their eligibility for the fragmentary social services that the Mexican government and several Catholic church organizations offer to migrants in Nogales: one phone call, a half-fare bus ride home, three nights in a shelter, and, most generously, fifteen days of free meals twice a day at the comedor, or soup kitchen, run by the Proyecto Kino, supported by both the Mexican and several US archdioceses of the Catholic church. After processing, the migrants emerge on the Mexican side of the border. Taxi drivers and food vendors accost them as they stumble out, dazed and bewildered. “Everybody wants to pretend to be a migrant, to get services,” one provider told me. “You have to look at their shoes. If they have shoelaces, they’re not migrants. Homeland Security takes their shoelaces so they won’t . . .” He gestured slitting his throat and laughed conspiratorially. So the migrants stumble because their feet are raw and torn from walking through the desert, and because they have no shoelaces in their tattered shoes. If they’re lucky, one of the first people they’ll encounter is Sal, with the Transportes Fronterizos (Border Transport) company, contracted by the Mexican government to provide transportation services for deportees. Sal is a deportee himself. In his twenties, he speaks English with a perfect Chicano lilt. That’s not surprising: he came to the United States with his parents when he was three and grew up and graduated from high school in Arizona. “How did you get deported” I asked him, quickly realizing that we should communicate in his preferred English, rather than Spanish. “You don’t want to know,” he grimaced. “Jaywalking.” Was it racial profiling? The police stopped him for crossing a street where there was no crosswalk, asked him for his documents, and arrested him. In Arizona, local police are empowered to enforce immigration laws. Sal can tell migrants where to find free food and shelter, and how to access the transportation services offered by Grupo Beta, the Mexican government agency charged with removing migrants from the border to prevent them from attempting to recross. He keeps his booth open from 10 a.m. until 6 p.m., when the last bus leaves for the shelter. Migrants who get deported after that have to sleep on the streets. Most migrants leave their homes in Mexico with identification papers, money, and family members or other traveling companions. Most are deported alone and can spend days or weeks trying to determine the whereabouts of husbands, wives, children, or cousins. Many have also lost their documents and their cash. The buses arrive every few hours, all day and night. The migrants who are dumped and wander the streets of Nogales are the true refugees of the border wars. At the door of the Proyecto Kino soup kitchen, the long line for breakfast starts forming around 8:30 a.m. Some migrants arrive by bus from the shelters, others by foot after spending the night on the street or in the cemetery. The hundred or so men line up on the right, and the ten to twenty women and children, who get served first, on the left. To get in when the comedor opens at 9 a.m. for the first breakfast shift, all of them have to show their deportation document. The paper that proves that they were hunted, captured, and deported for not having the proper documents to enter the United States now becomes their ticket to a free meal. A young man spent three days waiting outside the exit port. He and his wife were separated during the deportation process. “Her name is Brenda. She was wearing gray sweatpants and a green T-shirt,” he told everyone who would listen. As each bus arrived, he stood waiting with a desperate hopelessness, watching the deportees slowly trickle out, searching for her familiar face. As part of No More Deaths, I could offer these people only a few tokens of aid: a phone to call their relatives, donated clothes and socks, a granola bar or rehydration drink. I could beg them to share their stories with us, so that we could tell them back in the United States and try to change our immigration policies. At the end of the day, we’d walk back to Nogales, Arizona, stepping lightly across the border that had destroyed and divided their lives. In Tucson, Arizona, the Federal Court processes seventy migrants a day through the Operation Streamline program. About 4 percent of migrants who are captured are sent to Streamline, which began functioning in Tucson in 2008 after beginning in Texas as a pilot program in 2005. Between Tucson and Yuma, the other Arizona district using the program, some thirty thousand migrants are “Streamlined” every year. Unlike most deportees, Streamlined migrants are charged with a criminal offense and imprisoned. The daily hearings fall somewhere between a kangaroo court and a slave auction. The migrants are shackled hand, foot, and waist, and sit in rows taking up about half of the courtroom. The judge calls them up in groups of ten or so, and their harassed lawyers, who represent four or five defendants a day, scramble to accompany them. Almost all of these migrants were captured in the desert, and are blistered, exhausted, disoriented, and dehydrated when they are placed in cells. They describe being stripped of their belongings and their jackets and left to shiver in T-shirts under the air conditioning, being placed seventy or eighty people deep in cells designed for four or five. There is no room even to sit, much less lie down; they receive only a small juice box and a packet of cheese crackers in two days. Most answer that they are citizens of Mexico, though on the day I attended the hearing, there were several Hondurans and Ecuadorians. A court interpreter repeats the questions in Spanish simultaneously, and the defendants listen through headphones that they can’t touch because their hands are shackled to their waists. Their lawyers prompt them if they falter in their responses. Mostly, they answer s” to everything, which the interpreter dutifully translates as yes, except to the port-of-entry question, to which they are supposed to answer no. Some answer dully, staring at the ground; some respond in strong voices, looking up at the judge. A few are dismissed because they don’t speak Spanish, and the court has no interpreters for the indigenous languages of Mexico. A few scorn the headphones and answer in English. “How do you plead to illegal entry, guilty or not guilty” was the judge’s last question. Every prisoner answered dutifully, culpable--guilty. Most were sentenced to time served and prepared to be deported to Nogales, Mexico. They will leave the country that they sacrificed so much to get to with a criminal record and the threat of up to twenty years in jail if they enter again. They will be among those arriving in Nogales, penniless, lost, and bewildered. What we saw was only part of the picture. The trip to the border can be as dangerous as the crossing and passage through the US side. Every year, many thousands of migrants are kidnapped as they travel through Mexico. Gangs and drug smugglers see migrants as easy targets and count on the fact that the friends or relatives in the United States who raised the thousands of dollars to fund their trip will be able to generate more to pay for their ransom. As violence in the border region increased, migrants made up many of the victims. If a ransom was not paid, or if migrants refused to work for the gang, they might be killed, sometimes in massacres that claimed the lives of dozens. The many competing interests at stake in the development of law, policy, and ideology surrounding undocumentedness have led to a perplexing and constantly shifting landscape. To understand the changes of the late twentieth century, we need to understand how the system worked before that. From the eighteenth and, especially, the nineteenth centuries on, the United States benefited from its place in the global industrial economy, and white people in the United States benefited from their place in the racial order. A dual labor market developed in which some workers began to become upwardly mobile and enjoy the benefits of industrial society, while others were legally and structurally stuck at the bottom. This dual system was reproduced both domestically and internationally, and race played a big role in it. Legal systems were created to justify and sustain it. Globally, the system was expressed through colonialism. Europeans colonized people of color around the world and benefited from their forced labor and their resources. In the United States, slavery played a big role in sustaining a dual labor system, where whites could move up, but blacks could not. The United States took some colonies, too, at the end of the nineteenth century, like the Philippines, Cuba, and Puerto Rico. But US companies and citizens also benefited from the dual labor system when American companies like United Fruit established plantations in Central America and produced bananas using cheap labor there. They benefited when Brazilian slaveholders or German coffee planters in Guatemala used forced labor in those countries to supply cheap coffee for US markets. Mexico played a big role in the dual labor market in the United States, both domestically and internationally. US mining companies operated in both countries from the late 1800s, and in both, they employed an explicit dual wage system. Mexicans received a lower, “Mexican” wage, while white US citizens received a so-called gold or US wage. Inside the United States, Mexicans were welcomed as migrant workers as American investment in the southwest grew after the territory was taken from Mexico in 1848 and 1853. A reliance on Mexican workers who contribute their labor to US economic enterprises--but are denied access to the benefits that US law affords its citizens--has underpinned the economy for over a century. Over the course of time, different legal and structural mechanisms have been used to maintain this system. Early on, it was done by legally distinguishing immigrants from workers. Immigrants were the Europeans who came to Ellis Island; workers were the Mexicans and Chinese who built the railroads and planted the food that sustained white settlement in the newly conquered west of the country. They were not expected to settle, stay, or become citizens. Citizenship, after all, was reserved for people defined as white until after the Civil War. US immigration law thus treated Mexicans not as potential immigrants but as sojourners, temporary migrants who entered the country to work, rather than as immigrants who intended to stay. Anti-immigrant sentiment was directed against newly arrived Europeans, not against Mexicans. Anti-Mexican racism was also common, but it was directed against the supposed racial category of Mexicans rather than their status or citizenship. Until 1924, the new border between the United States and Mexico was virtually unpoliced, and migration flowed openly. Mexicans were exempted from the immigration restrictions passed into law before 1965. Because they were not considered immigrants, Mexicans were also permanently deportable and were, in fact, singled out for mass deportations in the 1930s and 1950s. The nonimmigrant status of Mexican workers over time underlies the apparent paradox between the United States as a so-called country of immigrants and its xenophobia and restrictive immigration policies. The creation of citizenship by birth through the Fourteenth Amendment was aimed at remedying the historic exclusion of African Americans. But it also created the apparent paradox that other nonwhites--like the Chinese--could become citizens through birth. Congress quickly moved to remedy this by restricting the entry of Chinese women in 1873 and all Chinese with the Chinese Exclusion Act in 1882. California’s farms then became even more dependent on Mexicans who, unlike the Chinese, could still be counted on to leave after the harvest rather than remain in the country and eventually become citizens. In 1928, the Saturday Evening Post reported that there were some 136,000 farmers in California, 100,000 with farms of under 100 acres, and 83,000 farming fewer than 40 acres. These small farmers did not use hired labor during most of the year, but during the harvest, required some 10 to 50 additional workers. “Fluid, casual labor is for them a factor determining profits or ruin,” the Post explained. “Mexican labor fits the requirements of the California farm as no other labor has done in the past. The Mexican can withstand the high temperatures of the Imperial and San Joaquin valleys. He is adapted to field conditions. He moves from one locality to another as the rotation of the seasonal crops progresses. He does heavy field work--particularly in the so-called stoop crops’ and knee crops’ of vegetable and cantaloupe production-- which white labor refuses to do and is constitutionally unsuited to perform.” Mexican labor, the author estimated, comprised from 70 to 80 percent of “casual” or seasonal farm labor. This informal system of rotating labor prevailed until the 1940s, when it was supplemented by a government-run system that continued until the mid-1960s, the Bracero Program. The Bracero Program, which brought in over 4 million workers between 1942 and 1964, was terminated in the context of civil rights organizing that highlighted the discriminatory treatment of these guest workers. But the economic structures that relied on these workers didn’t disappear, and neither did the workers; they just returned to the old, informal system. But, suddenly, the old system became illegal. The 1965 immigration law, which coincided with the termination of the Bracero Program, responded to the domestic and international movements for racial equality by getting rid of the racial and national quota system that had prevailed until then. It gave every country an equal quota. And it included the countries of the Western Hemisphere for the first time, considering Mexicans as potential immigrants rather than just exploitable workers. Given the structural realities of Mexican migrant labor, treating Mexicans equally under the new law was actually a way to keep exploiting them, but now, by calling them “illegal.” From 1965 on, new laws made them more and more illegal and took more and more rights away from them. Although it may seem contradictory, restrictive immigration laws actually contributed to a rise in both legal and “illegal” immigration. Two immigration scholars point to a synergy between the way the 1965 law privileged family members of US citizens and legal residents--in many cases, exempting them from the new quotas--and the barrage of laws after 1965 that progressively restricted the rights of noncitizens. It wasn’t the new quota that led to increased Mexican legal immigration after 1965, since the quota drastically reduced the number of Mexicans allowed to immigrate. Instead, it was the punitive aspects of that and subsequent laws that increased the numbers of those who decided to become immigrants, rather than sojourners. In other words, workers decided to stay, bring their families, and become immigrants because the earlier, seasonal pattern was becoming increasingly criminalized. Some of the very organizations that were pushing to expand legal and social rights in the United States in the 1960s continued to draw a line at the border. The United Farm Workers union campaigned against “illegal” workers in the 1970s. California Rural Legal Assistance and the UFW supported the nation’s first employer sanctions law--making it illegal for employers to hire undocumented workers--in 1971. The first attempt to implement such sanctions at the national level was in 1973, at the initiative of the AFL-CIO and the NAACP. (By the 1990s, all of these organizations had changed their positions and opposed the employer sanctions that were created by the 1986 Immigration Reform and Control Act.) But employer sanctions turned out to be just one more way to maintain a large, exploitable pool of workers to fill agriculture’s most backbreaking jobs. The sanctions could be suspended, as they were after Hurricane Katrina, when federal contractors desperately needed migrant laborers to clean up and rebuild the city of New Orleans. Since the 1980s, economic restructuring in the United States has created some huge new demands for extra-legal workers who will contribute to the economy for low wages and few benefits. Many undocumented people today work at jobs that have been in-sourced. While most of us are familiar with outsourcing--when jobs, from manufacturing to call centers, are shifted overseas--in-sourcing is less well known. The phrase can refer to a company’s decision to carry out internally those tasks that were previously contracted out, or it can mean that a company brings back a job that had been outsourced abroad. Here, though, I’m referring to a particular kind of in-sourcing: when a company closes down an operation in order to move it somewhere else inside the United States where it will have access to cheaper (often immigrant) workers, lower taxes, fewer environmental or health and safety regulations, or other financial incentives. Almost everybody in the United States benefits from that labor in one way or another, because it underlies almost all of the goods and services we use. Whether they work in agriculture or in-sourced industries like meatpacking, or whether they work in landscaping, newspaper delivery, or cleanup after environmental disasters, the invisible labor of undocumented workers sustains the economy. Moreover, the presence of these migrants also serves to create more jobs. By living in the United States, by spending money and consuming goods and services themselves, they sustain the jobs of other workers. 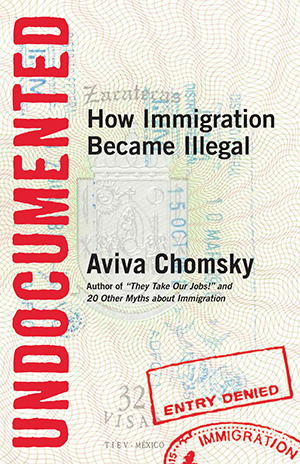 The work that undocumented migrants do is essential to the functioning of the economy and to the comfort of citizens. The system is also, however, fundamentally unjust. By creating a necessarily subordinate workforce without legal status, we maintain a system of legalized inequality. It’s a domestic reproduction of a global system. The border is used to rationalize the system globally; it makes it seem right and natural that exploited workers in one place should produce cheap goods and services for consumers in another place. Illegality replicates the rationale domestically: it makes it seem right and natural that a legally marginalized group of workers should produce cheap goods and services for another group defined as legally superior. At the same time that these big economic shifts were occurring, other political, social, and cultural changes were happening globally. After World War II, overt racism and white supremacy began to lose ground. Europe slowly and painfully let go of most of its colonies, and the number of independent countries proliferated. Almost all of the new independent countries were run by people of color. In the United States, civil rights movements fought to dismantle legalized discrimination. South Africa became an international pariah and finally ended apartheid. In an important book published in 2010, though, Michelle Alexander argues that the racial caste system that United States has maintained since the days of slavery did not end with the passage of civil rights legislation in the 1950s and v´60s. Rather, a new system of legalized discrimination developed to replace the old Jim Crow system. The new system, she writes, is mass incarceration. Black people--and, as I argue here, Mexicans and other Latin Americans as well--were systematically criminalized. Although, on the surface, the system is color-blind, in fact, it targets people of color. But it works better in this supposedly postracial age, because it never uses race directly to discriminate. Instead, it criminalizes people of color and then discriminates on the basis of their criminal status. Most citizens who rail against the undocumented insist that their opposition is based solely on technical, legal grounds: they oppose people who broke the law. But becoming undocumented is a highly racialized crime. Nationality itself has its origins in racial thinking and still bases itself on birth and origin in ways that echo racialism. The categories “Mexican” and “Latino” have been racialized in the United States, and the category of illegality is heavily associated with the category “Mexican,” whether this is understood as a nationality, an ethnicity, or a race. In 2011, 93 percent of federal immigration crimes were committed by noncitizens, and 89.3 percent of them were committed by Hispanics. Alexander focuses not only on incarceration itself, but on what happens after release. “Once [prisoners] are released, they are often denied the right to vote, excluded from juries, and relegated to a racially segregated and subordinated existence. . . . They are legally denied the ability to obtain employment, housing, and public benefits.” Possession of a felony conviction, then, replicates the very legal restrictions that used to be enforced by Jim Crow. In the ideology and culture of exclusion, as well as in the laws and mechanics of its implementation, the arguments Alexander makes about African Americans have a parallel in the situation of immigrants. Like the African Americans that Alexander studies, large portions of the Latin American immigrant population have also been permanently criminalized and legally excluded. As with African Americans, undocumented immigrants are criminalized by a system that is superficially raceblind and defended on that basis. Just as African Americans have become stigmatized in the post¬±civil rights era through criminalization, so have immigrants. Before, legal discrimination could be based explicitly on race. When race-based discrimination was outlawed, a new system emerged: turn people of color into criminals. Then you can discriminate against them because of their criminality, rather than because of their race. A new legitimacy for discrimination was thus born. Chomsky discussed the U.S.'s exploitation of migrant workers with Amy Goodman & Juan González on Democracy Now!